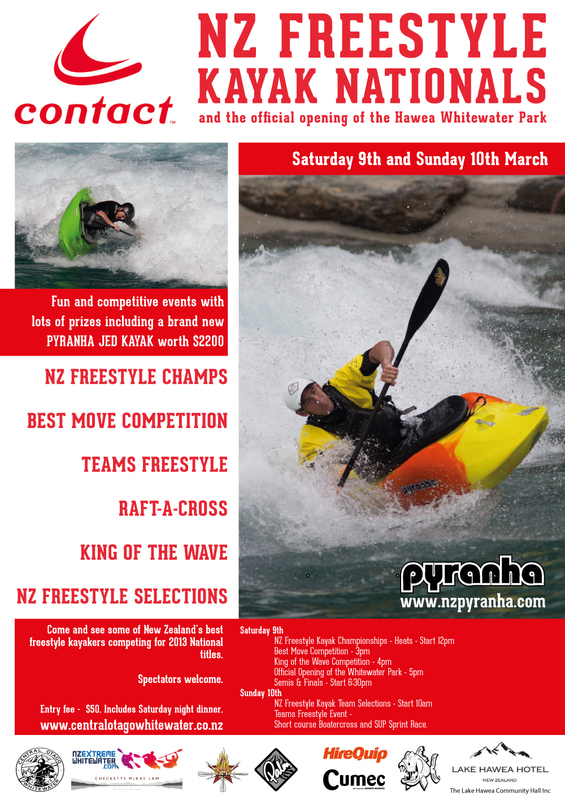 Central Otago Whitewater in association with NZ Extreme Whitewater is hosting the 2013 New Zealand Freestyle Kayak Championships on the 9th and 10th of March at the new Hawea Whitewater Park. Over two days kayakers from around New Zealand will descend on the new park to compete for the National Freestyle titles and for selection spots on the NZ Freestyle Kayak team. The weekend is being designed to promote the new park and incorporate the official opening of the Hawea Whitewater Park. There will be several fun events alongside the National Championships meaning that there will be fantastic spectacle of whitewater kayaking. Thanks to the support of several sponsors there will be a range of spot prizes including a brand new Pyranha Jed Kayak from NZ Pyranha. Paddle-Power the NZ distributors of Palm, Shred Ready and Sweet Equipment will also be on hand showcasing the latest gear. The Lake Hawea Hotel is also providing some bar tabs and accommodation packages for lucky participants.